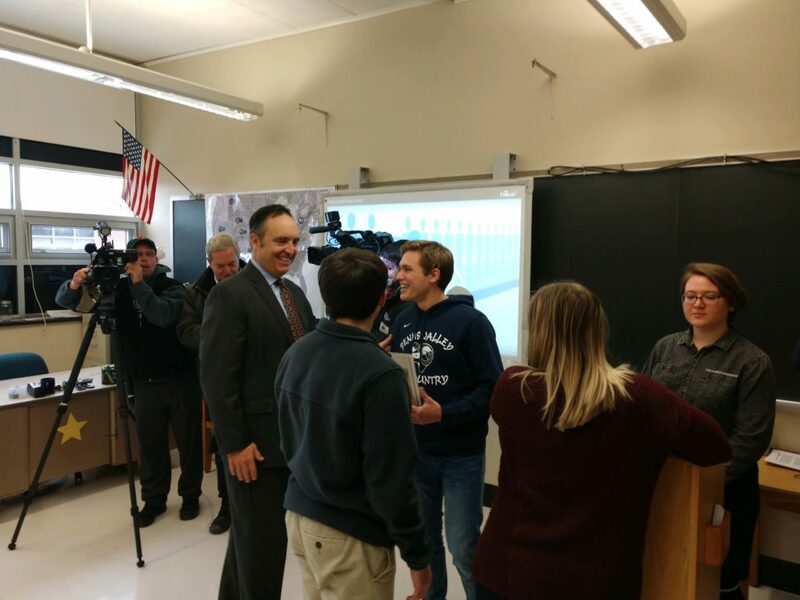 The video submitted by the Penns Valley Area High School PVmedia class has advanced to the semi-final level of the “Talk to Your Senator” video competition. The statewide contest was sponsored by the Senate with support from members of the Drug and Alcohol Service Providers Association of PA. It was designed to get students involved in legislative efforts to fight heroin and opioid abuse. Students were encouraged to submit video entries of no longer than five minutes that highlight ways to combat abuse, help those who suffer from addiction and develop laws to address the current crisis. As a semi-finalist, the Penns Valley students, along with the other semi-finalists, will be judged by a panel of professionals who are experts in the drug and alcohol field. The judges will score each entry based on several factors, including the overall message, content, and creativity. The “Talk to Your State Senator” grand prize winners will be announced in April. Good luck to the PVmedia students as they compete with their peers throughout the state. I encourage everyone to take a few minutes to watch their compelling video. As always, it was fun to visit with everyone at the Huntingdon County Rotary. We had an engaging conversation about the things that matter in our community like the state budget, Congressional redistricting in Pennsylvania and school safety. 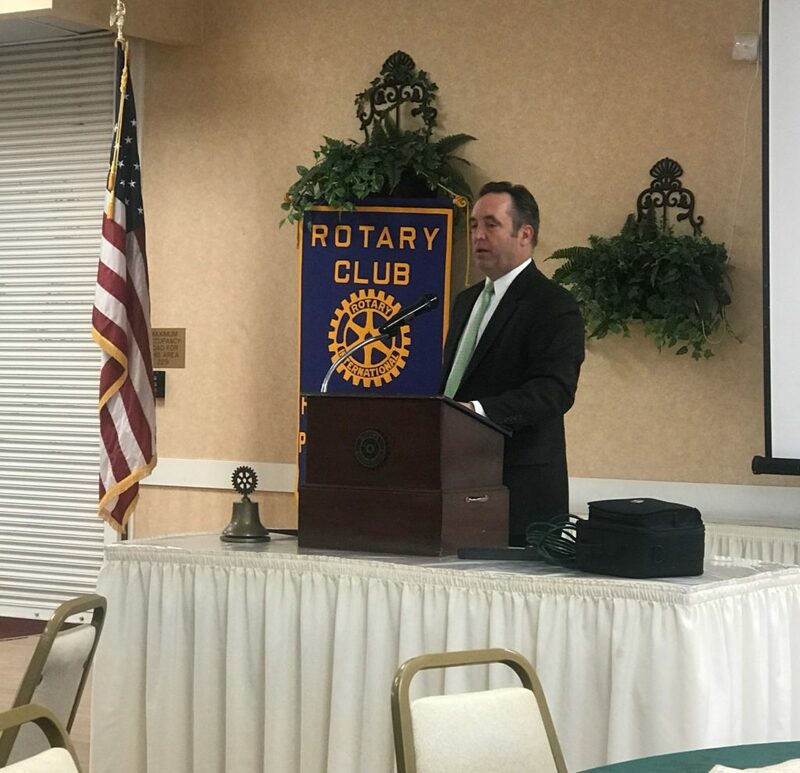 Like with all of our area Rotary Clubs, the Huntingdon County Rotary brings community leaders together to provide valuable services to our local neighbors in need while building fellowship among its membership. College Township will receive $42,524 in state money to improve safety at the intersection of Park Avenue and Interstate 99/U.S. Route 322. The money will be part of a project to change the northbound left turn at the intersection of Park Avenue and I-99 southbound/Route 322 westbound on-ramp to a dedicated protected left-turn operation. Improvements to this intersection will greatly increase safety while helping to reduce traffic congestion. Enhancing traffic flow and safety improves the well-being of our community and encourages economic development throughout the region. The money comes from the Automated Red Light Enforcement (ARLE) program, which is funded through fines from red light violations at 30 intersections in Philadelphia. Projects receiving funding must improve safety, enhance mobility and reduce congestion. Municipalities from throughout Pennsylvania submitted 143 applications, totaling over $34 million in requests. College Township was one of 35 municipalities to receive funding for a total of $11.5 million for 41 safety projects. Projects were selected by an eight-member committee based on criteria such as benefits and effectiveness, cost, local and regional impact, and cost sharing. Since 2010, about $62.87 million in grants have been awarded through the ARLE program, funding 366 safety projects. Avail Technologies, Inc. of State College has been selected to implement a Fixed Route Intelligent Transportation System (FRITS) for 32 transit systems that will offer real-time service information for passengers, flexible fare payment options, and enhanced transit planning. The nearly $35.7 million, 5-year project will begin this spring and installation is estimated to occur over three years. The company currently employs 81 people at its State College headquarters, and anticipates a 10 to 20 percent staff increase because of this and other recent contracts. 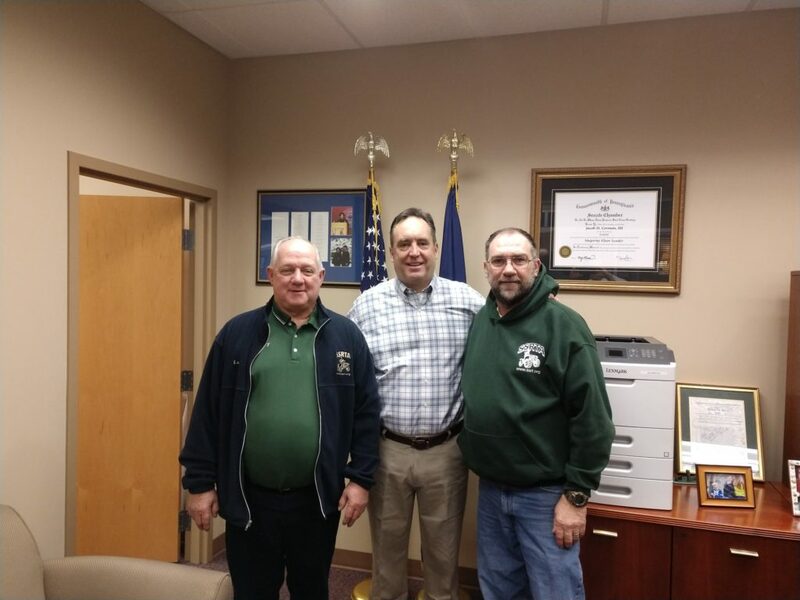 It was a pleasure to meet with members of the Snow Shoe Rails to Trails Association to learn more about new initiatives designed to connect the Bloody Skillet and Whiskey Spring trails. This will eventually provide a connection between municipalities in Centre County to those in Northern Clinton County and beyond. The Pennsylvania Department of Transportation (PennDOT) is reminding state residents that current driver’s licenses and photo ID cards can still be used as valid identification for commercial air travel and entrance to federal buildings through at least October 10th of this year. PennDOT is working to comply with federal REAL ID photo identification standards and expects to be able to offer customers new REAL ID-compliant licenses beginning in spring 2019. PennDOT is encouraging Pennsylvanians to begin planning now if they would like a REAL ID-compliant license or photo ID next year. The agency will continue to file for extensions to ensure PA residents can continue to fly and have access to federal buildings throughout this process. More information on the steps state residents should take in order to receive a REAL ID-compliant license is available here. The Department of Conservation and Natural Resources (DCNR) is accepting applications for the latest round of grants for community conservation and recreational projects until April 11th. DCNR’s Bureau of Recreation and Conservation staff is available to assist in helping applicants develop and submit a competitive grant application. Detailed program information, access to the online grant application portal and more can be found here. Grant applications are available now.